Every fiddle leaf fig plant owner wants their ficus lyrata to grow into a tall, tree-shaped statement. Unfortunately, though, many indoor gardeners end up with a smallish, lopsided, unappealing version of the same. 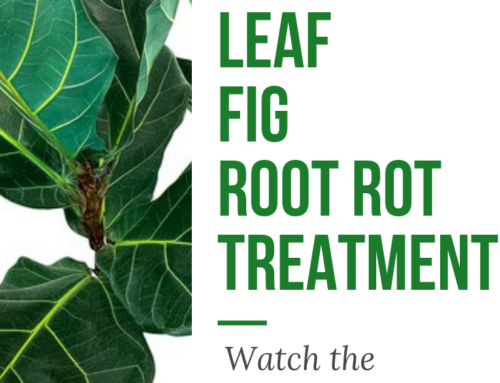 What can you do to strengthen your fiddle leaf fig tree trunk? One of the reasons weak fiddle leaf fig tree trunks happen is because the trunk fails to develop into the thick, strong, supportive and nourishing pillar it’s meant to be. Occasionally, fiddle leaf fig trees do grow tall, but still fail to stand on their own. So many images of this stunning plant are spoiled by the presence of a prop or stake to hold it up. 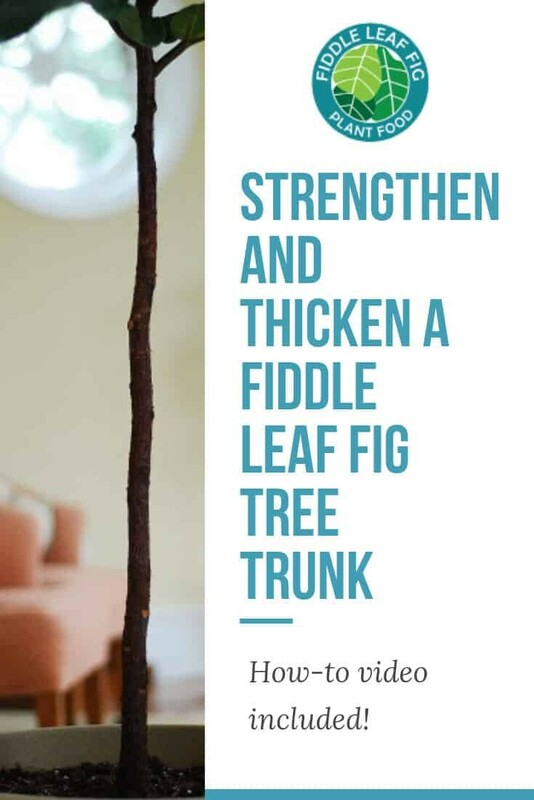 Today, in the below video, I show exactly how to strengthen and thicken a fiddle leaf fig tree trunk so it can grow strong, stiff, and tall, without depending on a stake to keep it upright. 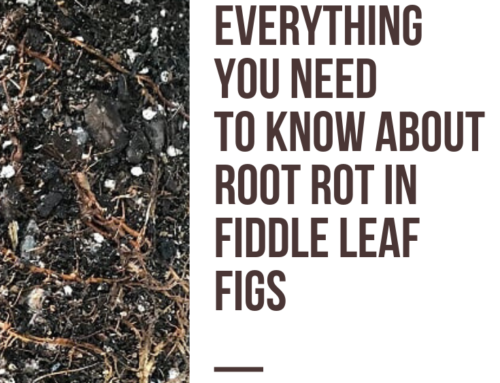 First, you’ll want to make sure you are fiddle leaf fig plants are in the sunniest part of the house, the one factor that matters most for growing a thick, strong trunk. 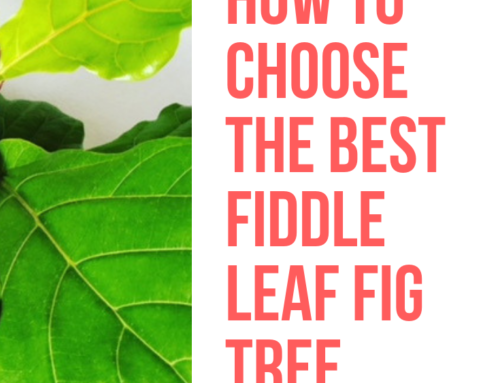 In the video, I show a mature, two-year-old fiddle leaf fig tree and a new, three-week-old, stake-dependent version of the same species. The goal is to transform the weak, lopsided, pencil-thin stem of the new adolescent plant into a thick, strong trunk like the older, more mature tree. The treatment I apply is to wiggle the plants as the wind would. 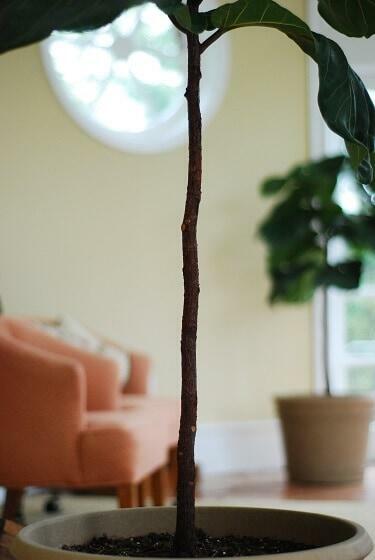 So for a young fiddle leaf fig plant I remove the stake, and separate a few of the leaves to locate the slim stem. Once I grab hold of it, I can safely wiggle it to mimic the wind. The purpose here is to simulate all of the benefits of a natural outdoor environment without the drawbacks (disagreeable elements like pests, drought, and shade from invasive neighboring plants). One of the most beneficial elements of the outdoors is wind. This idea first came to me when my organic farmer husband asked me to pass my hand over the top leaves of some veggie seedlings that were germinating in our sun room. He wanted to harden the babies off before planting them into the garden where they would encounter much more wind. The act of occasionally disturbing them this way thickened their tiny stems. Every time they recovered from the perturbation, they grew stronger, eventually outperforming their leggy counterparts. The exercise was so successful I decided to apply it to my young fiddle leaf fig plants. It took a little dedication, but the results were amazing. Once your ficus lyrata is older, you can scale your movement to mimic the occasional tropical storm or gusty wind that these trees would encounter in, say, their native West African tropical rainforest environment. I still wiggle my trees once or twice a week, or at least every few days, for two minutes at a time. 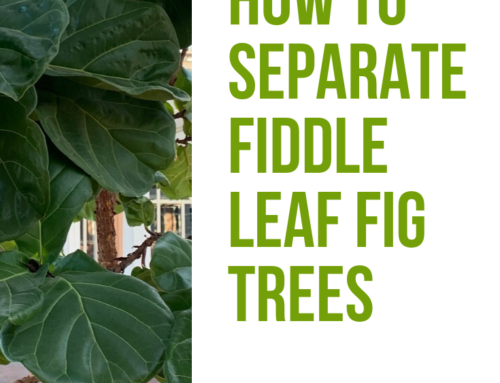 If your fiddle leaf fig is dependent on a stake now, then allow it to recover with the prop between these exercises. Eventually though, you won’t have to. The plant will stand on its own, all from its own inner strength. Now that’s empowering. 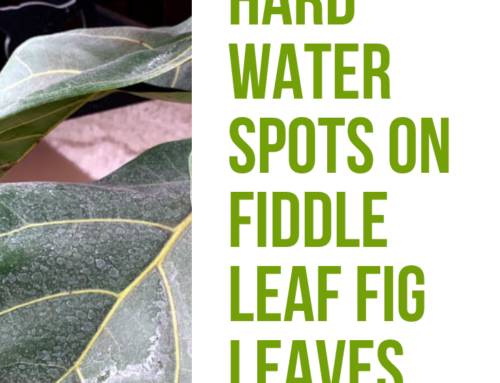 For more helpful tips on caring for and growing this strikingly beautiful houseplant, subscribe to our blog and join our free online Q&A community called the Fiddle Leaf Fig Plant Resource on Facebook. I’ll see you there!